WH Questions! - Volume 3 - What? Volume 3 of our WH Questions! series, What?, models appropriate questions and answers to a variety of “what” form questions, ranging from more concrete questions such as labeling questions, action questions, and descriptive questions, to more intermediate questions such as object function questions, to more advanced questions that require more logical inferencing to answer. 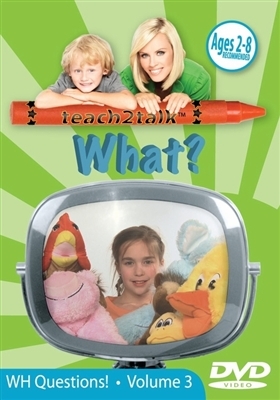 What?, Volume 3 of teach2talk’s™ WH Questions! series, uses real children to model appropriate questions and answers to a variety of “what” form questions, ranging from more concrete questions such as labeling questions, action questions, and descriptive questions, to more intermediate questions such as object function questions, to more advanced questions that require more logical inferencing to answer. In addition to helping teach receptive understanding and expressive usage of “what” questions, What? can also help children who have difficulty listening to details and describing what they’ve heard, which is a very important skill for social communication. teach2talk’s™ What? was created by a speech–language pathologist who has extensive experience working with children to teach them question forms, including through the use of video modeling, which research has shown to be an effective method for some children. Fun songs are also added to keep children engaged and help them further generalize any new–found skills! What? may be appropriate both for younger children just being introduced to “wh” question forms, as well as older children who have language or developmental delays. We decided to do a “what” questions video because so many children struggle with this question form – some of the more basic questions, such as “what is your name,” “what is it,” and “what are they doing” are easier for children, but as the questions advance to object function questions and then to questions which require them to listen to details or do some logical inferencing, they are often non–responsive or echolalic. I have been experimenting with this video with my client, and what questions that used to take me months to teach I can now teach in weeks – sometimes days – using this video. Not only that, but my clients are attending better and are having fun and motivated! Wh– form questions were so difficult for Evan. The “what” questions he really had a hard time with were the ones where the therapist would describe something like, “What fruit is red, round, and you eat?” Evan had a really hard time taking in the details and would zone out. With video modeling, he was attending and learning faster than in 1:1 settings! When Evan learned to answer “what questions,” it was really great because I could ask him about his day and have him tell me! WH Questions! - Volume 2 - Why? WH Questions! - Volume 4 - Who? WH Questions! Series - Complete Four Volume Set WH Questions! - Volume 1 - Where?